The decades of successful exploitation of satellite navigation systems GPS and GLONASS have confirmed their unique status as a basic resource for reliable worldwide, all-weather, all-season, round-the-clock positioning and timing. Nevertheless, the permanently widening sphere of their practical applications — as well as challenging requirements emerging from potential new users — give these systems a momentum for further evolution and progress. One of the key directions of their development is modernization of the air interface by means of adding new ranging signals to those already being transmitted. As is widely known, since 2005 GPS satellites have been launched that broadcast the new civil signal L2C, in addition to the encrypted P(Y)-code on the L2 frequency. More recently, the civil signals in the GPS band L5 have appeared on the air. In the near future — about 2014 — a new civil signal L1C will be available, too. All those new signals, as well as the corresponding ones on Europe’s Galileo system, are modulated by longer ranging codes compared to those on the legacy signals. These new, longer codes provide better correlation protection, that is, a lower level of the multiple access interference (MAI), which is a disturbance that impedes the reception of the desired satellite signal owing to the presence of signals from other satellites. *Another principal feature of note: all the new signals, unlike the original ones, contain a “pure” ranging code that serves as a pilot signal, in addition to the traditional data-modulated component. These data-less pilot signals are primarily intended to improve the stability of phase tracking, especially when a received signal is relatively weak. Certainly, similar efforts are being invested into the development of the GLONASS signals, where we should stress the specific trend toward code division multiple access (CDMA) signal multiplexing that has a better chance to be chosen as a basic platform for the future air interface than the frequency division multiple access (FDMA) inherent in the current GLONASS system. Simultaneously, Japan, China, India, and some other countries have been involved in projects aimed at creating their own global or regional satellite navigation systems, based on a philosophy analogous to that of GPS and GLONASS. Against this background, the idea quite naturally occurs to unify ranging code structures and modulation modes of the various systems in order to facilitate design and manufacturing of multi-system receivers. Further, such a unification of signal designs opens the way to finally integrate all available systems into a global GNSS network. Such steps seem to be all the more topical in light of the expected expansion of GNSS to new frequencies, for example, C-band. In the course of thinking over the preferable formats of signals for a next-generation GLONASS air interface, the authors have come to some insights that they hope may be interesting from this perspective. As all ranging codes arrive at a receiver with arbitrary mutual delays, a satellite navigation downlink presents a typical example of an asynchronous CDMA multiple user system. Such a system’s individual satellite ranging code is called a signature. As was already mentioned, one of the critical issues in designing systems of this kind is the MAI level. A quantitative measure of relative intensity of MAI induced by the l-th side interfering signature while processing the k-th desired signature is the normalized two-dimensional (2D) cross-correlation. Here τ and F represent shifts of an interfering signal versus a useful one in time and frequency, respectively. The list of heretofore known binary minimax ensembles can hardly be called rich. The generator of any Kasami sequence is quite simple and consists of two linear feedback registers: the first of length n generates a long m-sequence of period N and the second of length n/2 forms a short m-sequence of period N1 = 2n/2 – 1. The latter sequence is linked to the first one by decimation with the index 2n/2 + 1. Then the “pure” long sequence is the first in the Kasami set, the rest being produced by symbol-wise modulo-2 summation of the long sequence with cyclic replicas of the short. Minimax Kamaletdinov ensembles are of special interest thanks to having lengths different from those of Kasami/bent sets. Their generation is much more sophisticated against Kasami ones, while the set size K has the same relation to the length N, i.e., in being substantially small. For a longer discussion of the preceding points, see the articles by B. Zh. Kamaletdinov (1988, 1996) and the textbook Spread Spectrum and CDMA, referenced in Additional Resources. In summary, the analysis of this section clearly shows the attractiveness of Kerdock signature ensembles. Because they are as good as any other binary minimax ensemble in the matter of correlation protection, the Kerdock sets convincingly excel all of them in the set size, allowing them to accommodate as many satellite signals as is needed. This quality, in combination with the simplest technology of sequence generation, makes the Kerdock ensembles an ideal platform for the next-generation GNSS air interface. Since the advent of space-based navigation in the 1960s and 1970s, the spectrum deficit has been sharpening dramatically. One can foresee future limitations on spectrum compactness of GNSS signals becoming much tougher than currently. Meanwhile, the answer to the question: “How should we treat the concept of assigned bandwidth when applied to space-based radio navigation?” remains somewhat unclear. 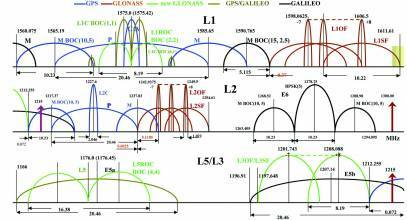 Indeed, consider for example the L2 band allocated to GLONASS: 1237.8–1256.8 MHz. But what are the specific constraints on the GLONASS spectrum intensity beyond this frequency range? Or, asked another way, what share of the total GLONASS signal power emitted beyond this bandwidth can be tolerated? With the code length preset there is no point in attempts to optimize signature ensemble based on criteria of average or peak MAI power over the wide Doppler zone. Instead, it seems adequate to search for a signature set with the lowest MAI peak under zero Doppler shift. Optimal signature sets with respect to the most unfavorable – static MAI — are minimax, that is, those attaining the Welch bound. Kerdock signature sets, distinctively advantageous against other binary minimax ensembles in the set size and generation complexity, make a good option as ranging code ensembles for future GNSS air interface. The MSK-type modulation mode is a proper choice to comply with the current rigorous limitations on navigation satellite out-of-band emissions as well as those that can be anticipated in the future. Ipatov, V.P., Spread Spectrum and CDMA. Wiley & Sons, 2005.